No, really. 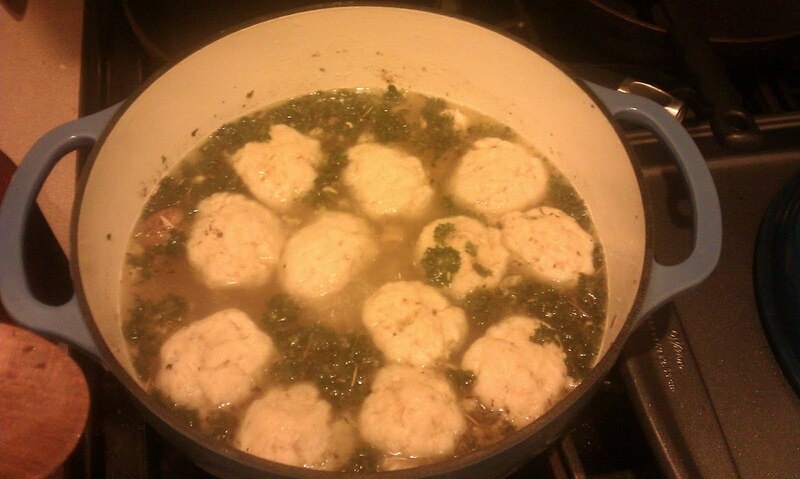 I am making chicken soup with matzo balls for dinner. There's something about soup that is so...well, perfect. I've rarely met one I didn't like. Except cold soups. I really need it to be at least marginally warm for me to want to eat it. And when there's a day like today when it's grey and overcast all day, soup is the perfect meal. Here's another mama from my internet group! Jennifer is a mother of two. 1. How old is/are your kid(s)? 2. How long have you been homeschooling? Human beings begin learning the moment they are born. I am 29... Shawn is 34. 3. What made you choose to homeschool? [If public schools were cut]... the level of general education would not decline, indeed, it would increase! The individualism and internal discipline needed for true focused learning would naturally emerge as some people pursue their academic interests while others, if compulsory school attendance laws are repealed, would try to get an early start in the business world. The morass of today's teenage subculture would largely disappear as young people's interactions would become more imbedded in the broader society rather than mired in the largely short term and superficial concerns of their peers... Hopefully, [Public school] will one day become a distant memory of a less enlightened past." I can home school. Many parents cannot, I am blessed to have that option. I don't agree with much of the curriculum, academic and otherwise, that the Public School espouses. I feel that the public schools are overcrowded, too many students per teacher. In home school, a student learns at their own pace, rather than having to meet the pace of the larger group, and they are not ridiculed by their peers for needing to spend more time on a certain subject. I believe that, largely, Public schools - and any education received by the student through public education - are, by very nature, externally driven. Thankfully there are true educators in our Public Schools who recognize this problem and create a grassroots effort to promote self directed education in their pupils. I believe that artificially segregating children by age rather than ability hampers true education. As the author above states so eloquently, Public schools are less about academic excellence and more about "the largely short term and superficial concerns of their peers". Everyone is roughly the same age, regardless of emotional or social advancement. The real world doesn't work like that. People are jumbled together in the real world with peers of different ages. Why do we want to educate our children in an artificial atmosphere? I am often asked if my homeschooled children will become socially adept adults if they don't take part in public school. I am forced to wonder how public school emulates "the real world" in any way! I believe in exposing a child to a wide variety of ideas and philosophies... in the Public School system, only those ideas sanctioned by the government are taught... this is ideal for indoctrination, not so ideal for independent thought and creative process. Competition rules the day in Public School. Some healthy competition is good, but when everything you do pits you against your peers, other schools, and even an arbitrary standard, it is difficult to love learning for its own sake. Being the best is all encompassing. 4. Is there a particular style you use (e.g. Montessori, spiritual, etc) and why? 5. Do you believe you will homeschool for your child(ren)'s entire academic life, or do you plan on using public, private or charter schools at some point? I believe in lifelong learning. I believe that I am, myself, still in my "academic life" because I am still alive. I will facilitate their self-directed education while they are children living in my home. If at some point their needs are no longer met at home, I am open to the idea of putting them in an institutional setting, private, public, or individual tutoring. 6. How do you respond to claims that homeschooling children leads to socialization issues and doesn't prepare children for the 'real world'? This is addressed in my treatise linked above, however... the most basic answer would be that Public School does NOT approximate the "real world" by segregating students by age instead of ability. This makes the issue a moot point. However, SOME children who are homeschooled ARE socially awkward. But, I think we can all agree that this happens in Public Schools as well. I doubt that the actual place of education has much to do with socialization. A child's personality and access to social situations does matter. That access can be given through any number of educational models and is not restricted to education outside the home. Home educated children have access to a wider variety of social situations than do their traditionally educated peers because they are not confined to a school for hours each day. 7. What is your biggest worry about homeschooling? Complying with local and state laws while maintaining the integrity of the experience for the individual child. Education must occur between 8 and 18. You must notify the local superintendent in writing and signed by the parent every year by Sept. 15th or within 2 weeks of school starting or upon pulling them out of school that you PLAN to homeschool, there are no other required information. There are technically required 180 days per year of instruction but the state recognizes that the hours per day of instruction may vary and so they don't really enforce that. There are required subjects and annual testing requirements, but only the parent sees the results. And the parent must meet certain requirements... for example, I am "qualified" because I have more than 45 college credits. You can also qualify by being supervised by a certified teacher, by taking a state certified course in home education, or be approved by the local superintendent. The only thing that gets my goat is the testing... publicly educated students don't submit to annual standardized testing. I think the standards should be the same for all students regardless of the mode of education. With the way some states operate, it is as if they don't trust parents to be able to educate their children. They NEED Big Brother to make sure they aren't ruining their kids... it is sad. At least in WA. the child's test scores are only given to the parent. The public may not even request them. The only time you have to divulge the scores to anyone is if you put your child into a public school. Also, the scores could go toward proving to a potential college that the student has met academic requirements. However, many many colleges (including HARVARD) have departments designed specifically to test homeschooled students to ensure proper placement. I am a voracious reader. Or, well, to be clearer, I was a voracious reader before I had Cecilia. Now I think I qualify just as an avid reader. I don't devour books at the breakneck speed I used to, because I simply don't have the time to dedicate to reading that I used to-- and that is fine! I'm now spending the lion's share of my time with the best thing that's ever happened to me, my sweet little girl. I turn on the bedside lamp. I open the Kindle and turn it on. Generally I read a book at a time, but sometimes I go back and forth between a couple. If it's one of those times, I load up whatever book I want to work on. I rest the Kindle on my husband, who generally goes to bed before me and is sound asleep by this point. I climb over the body pillow on the edge of my side of the bed, and ease myself down next to Cecilia, who is sleeping with her upper body on my pillow. I lay on my side and gently roll her into my arms, so that she is facing me, and snuggled in between my elbow and shoulder. I wrap that arm around her, but before I can read, I take several moments (sometimes several minutes) to study, memorize, and silently adore her sleeping face. I usually give her a multitude of kisses, super softly, so that I don't wake her. Then I grab the Kindle with the free arm on top. I rest it half on my husband's pillow and half on the windowsill, so it's at a 45 degree-ish angle. And then, all settled in...I read. I generally read for at least half an hour, sometimes an hour, sometimes more. When I can hardly keep my eyes open anymore, I get to a stopping point, close up the Kindle, turn off the light, and sleep until Cecilia wakes me up for milkies. I could probably get more sleep at night if I didn't read in bed, but I am honestly sure I would be lost if I didn't. Reading is such an ingrained part of me, and has been since my brother taught me how to read with a newspaper at the tender age of 2. I think it's safe to say that I have read for pleasure my entire life. I hope with my whole heart that Cecilia develops a love for the written word as deeply ingrained as my love. Sara is another woman from an online group. We all shared approximate due dates-- our babies range from February to May birthdays. Sara is a homeschooling mother of four. 9 1/2 years. I believe learning starts in utero but for the sake of this, I'll say since birth. There isn't just one reason. Both my husband and I felt led by God to homeschool since before we knew each other. We decided to follow that leading because we believe God has a divine purpose in each of our lives and directs us in specific paths and homeschooling is the path we believe He has led us down. We also have some major issues with what is being taught in the public school as well as how certain subjects are being taught. We cannot afford private school but, at this point, we wouldn't choose it anyway. We want to raise our children not just with learning of the mind but also learning of the heart but from a Christian, not a worldly, perspective. My oldest has ADHD and, while she scored ahead of her grade, she has struggled learning certain subjects such as math. Homeschooling has allowed her to go at her own pace, learning in unique ways, without pressure to keep up with classmates. She also has an auditory processing disability which makes typical classroom learning very difficult. Because we want her to excel, we feel like homeschooling allows her to learn in ways that are best for her without making her feel different or excluded. It also prevents teasing or bullying from children who may not understand her difficulties. Lastly, we feel that children need the nurture of family for as long as possible. Homeschooling allows them to be in the loving arms of their parents at any time. It also develops a close relationship with siblings because they are interacting on a daily basis without hours of separation. Nope. I call ours a smorgasbord. We've used and changed curriculum until we feel we've found what works best for each child. At this point, our plan is to homeschool through high school. However, life doesn't always go as we plan so I am keeping an open mind as to what will happen each year. I try to evaluate each spring whether I feel like homeschooling continues to be the best choice for our family. I'm not sure where this argument arose or why it arose. There are people who have been raised in public, private and charter school settings who still graduate with very little skills in relating to other people. A lot of the relations you tend to see at school arise around anger, bullying, jealousy and cliques. Why these would be considered necessary to knowing how to live in the "real world" is beyond me. And, I'm not sure where those claiming this argument think a homeschooling child is currently living. It is not as if we who homeschool place our children in an isolated environment. A child who is homeschooled isn't left unattended, or at least shouldn't be left unattended, all day. It just means that their learning is done at home. So, they are still surrounded by others whether it is adults or other children. For my children, they are surrounded by myself and my husband, their siblings, the children at church 3 times per week, dance class, playdates, field trips and other activities. Our children have experienced no issues with trouble socializing. In fact, our oldest, who is the oldest by 4 years, is one of the most outgoing children I know and has no issues with making friends and fitting in in a classroom setting. Being able to keep up with organization and what needs to be accomplished each day, week, month and year. 8. Briefly, what are your state's guidelines for homeschooling families? If you feel comfortable saying it, feel free to indicate what state you're in. MN: Start date age 7. Yearly testing though the results only have to be turned over to the state if the child scores in the lower 20%. Yearly information turned into the school district by October 1st including vaccination information and a school calendar. I follow the guidelines written up in MACHE (Minnesota Association of Christian Homeschool Education). Because neither my husband nor I have a college degree, we have to turn in quarterly report cards, but we choose the scoring. That's all I know for now, for elementary age. I'm not sure if it changes in later school years. We are also members of HSLDA, a legal defense agency for homeschool families. Most of you probably know that nursing has not been an easy road for me. I have had a low supply the whole time, although it used to be quite a bit higher than it is now. In spite of taking countless combination of herbs, medications and foods, my supply is simply becoming nonexistent. Nursing also hurts now, every time, most likely because she's almost nursing dry. We're still pushing on, though, and for a few reasons, I won't be weaning Cecilia off my breast any time soon. The most practical reason is because she doesn't take a bottle and she has not yet gotten to a stage in her solid foods journey where she is replacing any "meals" with solids-- she still nurses as much as she used to in addition to eating some solids. But really, the biggest reason is because of the bond nursing gives us. If I hated it desperately and was in agony, I could probably figure out a solution-- a sippy cup without a valve, a regular cup, try every single bottle ever manufactured, whatever-- but I am lucky to have a high tolerance for pain and (in this case) a stubborn streak. I love nursing even when it hurts. Having my child right there at my breast reminds me of the months she spent inside my tummy, and then it reminds me of nursing a little itty bitty newborn Cecilia, and then a slightly bigger Cecilia, and so on, until I get to the funny little 9 month old with her nursing leg gyrations (as seen above). So yeah, not stopping any time soon, even if my milk dries up completely. I'm a lucky, lucky mama to have milk donors who will keep my daughter in breastmilk even if I can't. The homeschooled child is 5 1/2 at the moment. We had always planned to homeschool because neither my husband nor myself felt that the school system worked very well for either of us. On top of that, my son was born with extreme allergies and I do not feel comfortable sending him into an environment covered in allergens likely to give him hives daily. No. I picked a curriculum and am supplementing with other sources. I don't do everything the curriculum says to do and I add things that I think would fit well with the way he learns. If any of my children would like to go to public middle school, I'm willing to discuss it with them. If they want to go to public high school, they certainly may. I have no problem homeschooling until they graduate though. This question is a pretty common one and it's still annoying every time I hear it. School socialization is nothing like the "real world," in my experience. My child gets socialization with his cousins and other extended family members several times a week. He also attends music and karate lessons with his family. He is learning manners and how to interact with people and the world. There is a homeschooling group that gets together for hang-out time once a week, soccer time once a week (not in the winter), and at parks once a week. They also get together for field trips. We haven't attended many of these functions yet but will as the children get older. In Indiana we have to keep attendance records and they're required to attend school for 180 days a year. No subject requirements or testing is required. After the horrific acts committed yesterday by a man who may very well be schizophrenic, and most certainly is at least troubled, I can't help but be grateful for our little family's, and our extended family's, safety. You see, we very well could have been there. We have all gone to Gabby's rallies before, and other political events. We adore her, always have. The idea that we very well could have been caught in that massacre is exceptionally sobering. We don't personally know anyone who was injured or killed in the bloodbath, but we have learned that the husband of the doula who runs the mom and baby group at our local birth center was injured. Our hearts go out to her, and we're very thankful that he is alright. But a nine year old girl is not. A vivacious, bright girl who was at the rally because she had just been elected to student council and wanted to see what it was like to be a member of Congress. A girl who had been born during the tragedy of September 11, 2001, lost her life in another senseless tragedy. A 30 year old Giffords staffer who had just gotten engaged and was planning his wedding is not alright. A 79 year old man threw himself onto his wife to save her life-- and did so, at the expense of his own. A much loved Federal judge who wanted to see his good friend, the Congresswoman Giffords, is not alright. Six people dead, 14 injured, one-- our beloved Gabby-- critically so. It's so hard to fathom this happening in our own backyard. We're all so shaken, and I can't help but be thankful that we and our loved ones are safe and happy. Here's the latest installment in my homeschooling spotlight series!! Can I just stop and say how excited I am to be doing this? I feel like there needs to be more real information put out there about homeschooling and not just guesses and assumptions. Niki, like Ginger, is a mother of 4, and has been homeschooling for a while now. This is our sixth year. Our first child initially went to public school, but was bored and unhappy there. Our second child has behavioral issues and would have required medication to cope with a public school setting; he has since largely grown out of his issues without medication and is meeting or exceeding behavioral and educational standards. We utilize the Oak Meadow (Waldorf) curriculum, but also use a lot of unschooling and student-led principles. We want the kids to enjoy learning and to be accustomed to setting their own goals and achieving them with little pressure (just support and guidance) from us. We also don't push the children to learn things before they are ready for them; they end up learning the same things, but everyone is happier for having waited until the material seemed easier. We tell the kids that they can enroll in public school if they want to; we actually tried pretty hard to convince Becca (10yo) to try public school this year (5th grade), but didn't want to force her to. If they continue to be happy with homeschooling, they probably won't attend school until they start college or take a few community college courses as they're finishing up high school. Those claims are just funny. The kids are in the real world all the time, much more so than kids who sit at desks and are told not to talk for the majority of their day. We are out of the house at least 5 days a week, and the kids have many opportunities - planned and unplanned - to interact with other children and with adults. They each have at least 4-5 good friends, which is more than I can see happening for the public schooled children we know. They are in Homeschool PE classes through our YMCA, so they also "know" the children in those classes (enrollment is around 50 kids per class) in the way public schooled children would know other kids in their classes. I fail to see how they are at risk of being social maladepts given the sheer number of people they interact with on a daily basis. The real world and public schooling as we know it bear little relation to each other; in fact, it seems the whole point of public schooling is to remove children from the adult world. We - as a society - have this thought that school is essential to development, and few of us have ever considered why it is we think that. Just because school shaped so much of our childhoods doesn't mean it was essential; it just means it was influential. Where we are more than willing to blame any number of adulthood ails on how our mothers talked to us, we somehow turn a blind eye where it comes to schooling and how it may or may not have shaped us as adults. We really need to inspect things a little more closely than that. I have concerns that I will accidentally leave big holes in the childrens' education, by not thinking to bring up some topic or other. Knowing what your kids should learn and making sure they learn it is a fairly big burden. While still pregnant with Cecilia, I stumbled across a group referred to as a "Due Date Club"-- a group of women who are all due in the same month-- on the mothering.com forums. At first I was reluctant to post a lot, and I felt sort of like the third wheel as most of the women in the group had been chatting since finding out they were pregnant months earlier, and some even since when they were trying to conceive. Here I was, the upstart who joined at 6 or so months pregnant, and yeah, I definitely felt weird. But over time, I began to open up to these women, and now, we're a phenomenally close-knit group who are still in constant contact. We get to share joys and sorrows and talk about our rapidly growing babies. One of the women from the DDC writes a blog called The Trivial Pursuit of Happiness. Ivory's blog is one of my top 3 favorites to read, and I get so excited when she adds new posts! I feel very blessed that I got to meet her through our DDC. Throughout 2010, Ivory posted a weekly series called "A Year of Pleasures." The idea comes from the Elizabeth Berg (one of my favorite authors!) book of the same name. Each week, she strove to highlight something that she was thankful for, whether large or small. I adored reading this ritual of gratitude, and so I have decided that I will adopt the same idea for 2011. I will try my hardest to post once a week on what I am grateful for that week. So, here's the first one. What you see here is a veritable mountain of clothing, divvied up in bins by size. Everything here was given to Cecilia from one friend. Jenna has provided us with what I'm guessing is the equivalent of two complete wardrobes for Cecilia. There is everything from newborn to size 4T clothing here. Some of it is clothes she bought for her daughter, some of it is hand-me-downs from various relatives, and some of it even came from my own sister, whose daughter handed down the clothing to Jenna's girl. However they got to her, they have now come to me, and for that I am amazingly thankful. We have hardly had to buy anything at all for Cecilia, and that alone is a tremendous blessing, given our financial situation. 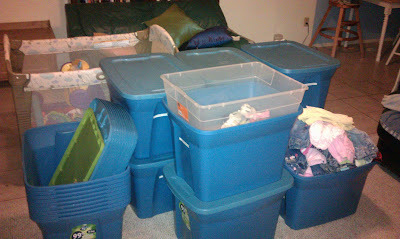 And here is all of the clothing folded and tucked into bins, each of which are labeled with the size of clothing within. 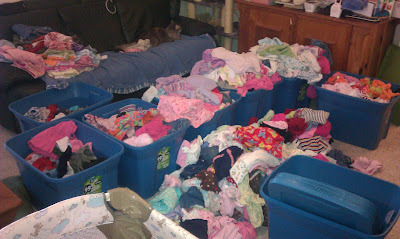 My goal for this week is to clean out Cecilia's dresser and closet, finish filling the 3-6 month bin with the stuff she has outgrown, and sort in the seasonally appropriate stuff from the 6-9 month bin (yes, my tiny is wearing some 3-6 and some 6-9 stuff still). Thank you again, Jenna, for being so generous! Nothing left to say...except this one last thing..
Searching for John Deere Girls Duck and Tractor Pink Infant Tank Top? Gee, look at all those eggs! Still Spindle Spinning - Cotton!